Home Yeh Rishta Kya kahlata Hai Yeh Rishta Kya Kahlata Hai 25th July 2018 "Naira-Kartik Gets Into Argument Over Divorce Naira is In Shock"
Yeh Rishta Kya Kahlata Hai 25th July 2018 "Naira-Kartik Gets Into Argument Over Divorce Naira is In Shock"
"Naira-Kartik Gets Into Argument Over Divorce Naira is In Shock"
As the episode starts Rukmani comes in excitement and tells them that Suhasini is coming to meeting them. Mohit asks her to control herself. She is coming so at least just listen what is she saying. And requests her not to give such an advise that I make the environment awkward. Devyani and Naitik say that they will discuss the matter before giving the statement. Anmol says to Naira that they will forget all.what they are saying now. And requests her to handle the situation. He wants to get married with everyone's support. Meanwhile, the divorce papers reached to Naira. She takes a pen to sign it. Bhabimaa cries to see the residual hopes breaking too. Kirti asks Naksh to request Naira to reconsider her decision once...only once. Naksh says that some decisions are not taken being reliant on others. We have to take it ourselves and hope our own nears and dears to support us. Naira feels disappointed to see Kartik's signature on the papers. She too signs the papers. Kartik asks Daadi to go in and he will come after parking the car. Naira listens Daadi talking to Panditji to not to declare any muhrat before 8 months. They don't want to make any haste. Daadi goes in. Naira thinks about which muhrat is Daadi talking and goes inside to ask her but slips on the stairs. Naira's mobile fell down. Kartik came from the back and took falling Naira into his arms. they both looked into each other's eyes. Naira handles herself and stood straight. Kartik moves ahead. As he tries to climb the stairs he too slipped into Naira's arms. Naira picks her mobile and Kartik asks her to go inside and he will come later. Naira says she wants to talk something. Kartik says he doesn't want to listen to anything. Naira says but still, she wants to speak as it's important. Kartik says it may be...but not for him.. Naira replies that it is important...for both of them as it's related to Mansi and Anmol. But Kartik still denied to let listen to her. Naira says it's fine... By the way, she signed the papers. Kartik says thanks to her in anger and she goes inside. They ask him about Naira and Kartik's divorce. They said that they even know that they signed the papers. So Naira will not be their Bhabhi anymore.?? And what will they call her now? Manish asks them not to think much as the court's decision is still pending. Luv and Kush inspired Manish to not to give up in Naira and Kartik's case. Daadi told to everyone that she talked to Panditji and he said that there is no auspicious moment for the wedding before 8 months. Rukmani says that muhrat doesn't matter a wedding meant to last will last and a wedding meant to break will break. And points towards Naira and Kartik. Bhabimaa asks her what is she saying. Rukmani diverts her statement and says they need to take the decision as soon as possible otherwise the kids would take the decision themselves. Rukmani and Suhasini were arguing over considering the muhrat. Naira goes to Kartik and tells him what she listened Daadi talking to Panditji on mobile... Kartik didn't trust her. Devyani was listening what Naira said. Devyani says to Suhasini that she didn't expected such fabricated statement from her. It's all a false story planned by her. Naira listened what she was talking outside. And asks Naira if it was true. Suhasini says that she herself will tell the reality. She plotted the story and lied because she is concerned for her family. She doesn't want what happened with Kartik and Naira to be repeated. She asked Naira that she don't know that they didn't break only relation between both of them but the relation between their families too. She questions what will they answer when they will be asked why didn't they tried to save a relation before joining the other. That's why she asked for some time from Panditji so that their matter could be solved first and later move ahead Mansi and Anmol. Bhabhimaa asks her not to connect both relations with each other. As if Naira and Kartik may break their relation they will still be connected through Naksh and Kirti. At the topic of Kirti Rukmani points towards her divorce too. And they again started arguing over Naira and Kartik's relation. Naira and Kartik both received a message. Rukmani suggests Naira and Kartik to put stay over their divorce for some time. Suhasini asks Kartik and Naira about it. Naksh says that it's wrong they can't blackmail them for Anmol and Mansi's wedding. Naira and Kartik said they can't as the papers have been signed and case has been taken to court. They got the first date. And requests everyone to keep their relation and Mansi and Anmol's relation apart. Naitik asks them to think once again. Kartik replies they don't need to think more and Naira says to let it go and focus on Mansi and Anmol. Suhasini and Kartik goes back. 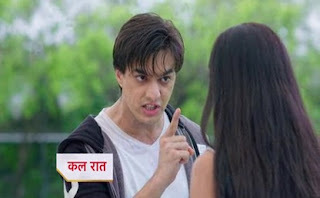 Kartik Threaten Naira not to Share Information with anyone Naira is Angry.